Claudio Caniggia at the 1994 FIFA World Cup for Argentina. We are just 30 days until the start of the FIFA World Cup and in 28th place we have Claudio CANIGGIA scoring in the 28th minute against Nigeria at the 1994 FIFA World Cup. A memorable match for a few reasons, it was a familiar face which scored both times for Argentina in their 2-1 win versus Nigeria. 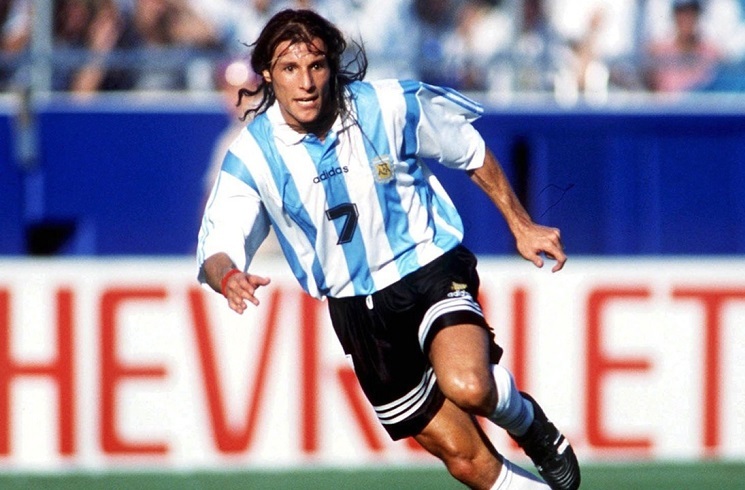 One of the main figures of the 1990 FIFA World Cup, Claudio CANIGGIA netted in the 21st and 28th minute for Argentina. Following a bad pass by Fernando REDONDO, the Nigerians quickly hit Argentina on the counter and scored early to give them a 1-0 lead. Alfio BASILE’s team were awarded a free kick and a powerful shot by Gabriel BATISTUTA reached the goalkeeper who spilled the ball and Claudio CANIGGIA latched onto it to draw level. The second goal was more came off a set piece play, this time involving two great friends. Diego MARADONA and Claudio CANIGGIA. BATISTUTA was fouled and with MARADONA setting up to take the free kick, Claudio had his arms extended, yelling “DIEGO, DIEGO” and MARADONA slid the ball in to him and a gorgeous right footed finish into the top corner saw CANIGGIA scoring his second of the match. It was also Diego MARADONA’s last match for his country as it was announced after the game following the infamous drug test.